Catholics in positions of power and influence in Londonderry have been asked to show more support for their Protestant neighbours. 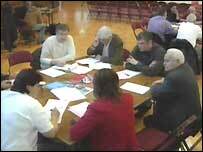 The call was made at a conference examining Protestant alienation in the city. The nationalist population dominates the west bank and there are now fears that Derry could become a permanently divided city. During the course of the Troubles, it is estimated that as many as 15,000 Protestants fled the cityside due to safety concerns. 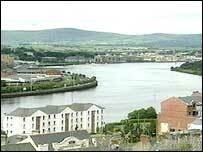 With less than 1,000 now living on the west bank of the River Foyle, a special conference has been hearing about the problems. Conference organiser Lee Reynolds said: "The city, for many is a cold house, it is not somewhere they feel comfortable within. "That is whether it is wearing school uniforms that could identify them as being from the Protestant community - they have drifted away from the city." Protestant community worker Brian Dougherty feared walking along Foyle Street with friends when they were in their school uniform because they were regularly beaten up. While things have improved, he said there were still concerns. "Come and shop and socialise in the city centre, but don't wear your Northern Ireland football top or your Ulster rugby top and certainly not your Glasgow Rangers football top," he said. "There is still a lot of work that needs to be done. "But certainly I would have to say that in my time as a community worker here in Londonderry, I have always felt a great deal of goodwill from many nationalist community workers." At Fountain Primary, a Protestant school, the principal now has to raise £13,000 each year to pay for transporting pupils across the Foyle. That is because 80% of them live in the Waterside. Principal Isobel McNally said: "I have been here for 15 years and the school has been thriving in that particular time. "Parents are coming across - this is where they choose and this is where they want to send their children. "Of course the school is going to survive. "We are not going to say no and I think we will get the support from the government, because we are certainly getting it from our community here in the west bank." 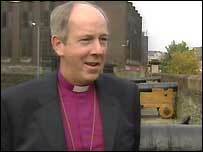 Dr Ken Good, the Church of Ireland Bishop of Derry and Raphoe, said he was happy living on the cityside. "I feel part of it. It is my city and I want to encourage other Protestants to feel exactly the same," he said.